Energy conservation is vital for today’s refinery economics to reduce per unit cost of production and to protect Environment. NRL contributes to sustainable development management through the integration of Environmental Social and Economic considerations in its work environment. The recent introduction of 90 RON unleaded motor gasoline is a further evidence of our concern towards good health and preservation of environment. The primary function of the HSE Department is to explore opportunities for environment improvement and energy conservation at Refinery Units, prepare and evaluate proposals and implement them. NRL has an HSEQ policy which is the corner stone in its decision making process to ensure compliance with the Environmental laws (NEQS) and achieve continuous performance improvement. Refinery consumes enormous quantity of thermal energy, supplied by combustion of fuel oils and fuel gas at furnaces. 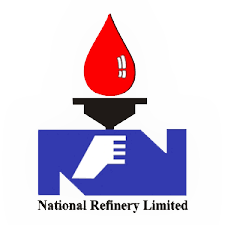 Number of energy conservation projects have been implemented at National Refinery, which has reduced energy consumption per barrel of crude oil. Large quantities of liquid effluents and gaseous emissions are also encountered in petroleum processing. Improvement programs are constantly undertaken at NRL to combat pollution in respect of emissions and effluent waste water. Regular monitoring of pollutants is carried out by testing of effluents and emissions samples to measure environmental performance. In recognition to the reality of sulphur reduction in HSD to make it environment and health friendly, the management has successfully put-up a hydro-desulphurisation plant for reduction of sulphur to limits set by the government. In order that Quality Standards and Environment practices at NRL are according to world standards, certification for Quality ISO 9001 Environment Management System ISO-14001 has been acquired. 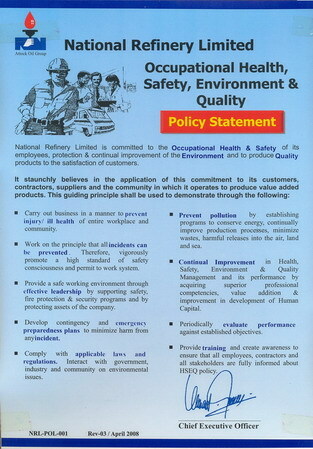 Likewise, for controlling of work related health and safety risks, OHSAS-18001, certification has been acquired. Implementation of ISO 9001, ISO 14001 AND OHSAS 18001 has put NRL as the pioneer in the country in areas of Quality, Environment and occupational health & safety certification.